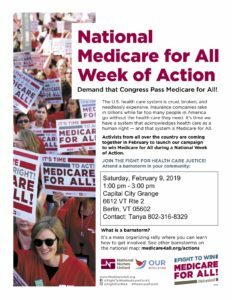 “Barnstorm for Medicare for All” is part of a national effort to get Congress to pass “Medicare for All”. This proposal would expand the current Medicare health insurance for people 65 and older to cover all Americans. Expanded and improved Medicare for all means everybody in, nobody out! Seventy percent of Americans support Medicare for All. In 2018, 70 congress members formed the first Medicare for All caucus to make universal health care a reality for all Americans.